The government yesterday urged the media to act with responsibility and avoid divulging information which could threaten national security even as an army Major who is facing a military court martial for alleged treason may face the death penalty. 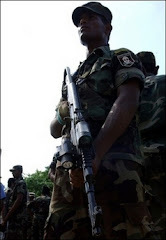 Already three army officers have been taken to custody for allegedly providing information to the LTTE in return for large sums of money, among them a Major who allegedly assisted the rebels to assassinate Maj .Gen. Parami Kulatunga. Military spokesman Prasad Samarasingha said of the three army officers detained, two were being investigated by the CID while one was facing a court martial, with the next hearing due on January 8. “If the officer facing the court martial is found guilty he can be given the maximum punishment – the death penalty - for treason under the army act 133/1. But that is upto the courts,” Brigadier Samarasingha told the media yesterday. The Brigadier said the military was perturbed with certain Radio stations which often alerted listeners when lightning road search operations were conducted in the city thus giving possible terrorist suspects the opportunity to use alternate routes and avoid being apprehended. “This may not be intentional but the repercussions might bring massive destruction,” Government Defense spokesman Keheliya Rambukwelle said. Responding to a question raised by a journalist on the alleged attempt to arrest the Sunday Leader newspaper editor Lasantha Wickramatunga last week, Minister Rambukwelle said the lead story in question could indirectly aid the terrorists. The report headlined “President to get Rs 400 million luxury bunker” created a stir in the defense circles resulting in an attempt by the CID to arrest Mr. Wickramatunga, a move which ultimately did not materialise. Minister Rambukwelle said if the report for example was to divulged security sensitive details relating to the weight of the metal plating to be used for such a bunker it would educate the LTTE on the weight of the explosives needed to successfully target the bunker. “It may not be direct but it may aid terrorism. Ranil Wickremesinghe, Karu Jayasuriya and Tamil leaders like V. Anandasangaree are also under threat, so this is not political. It should come from the heart,” the Minister said. Referring to yesterday’s Daily Mirror report headlined “2006 worst story for journalists”, Minister Rambukwelle said terrorism played a part in the threats faced by journalists and as such terrorism must be eradicated from the world. “According to the report 81 journalists were killed world over. In Sri Lanka it should be brought to zero. We are happy about the role played by journalists in Sri Lanka but at the same time journalists should act with responsibility,” the Minister said.